With my new toy that I blogged about recently I wanted a nicer interface for getting content on and off the Kindle. 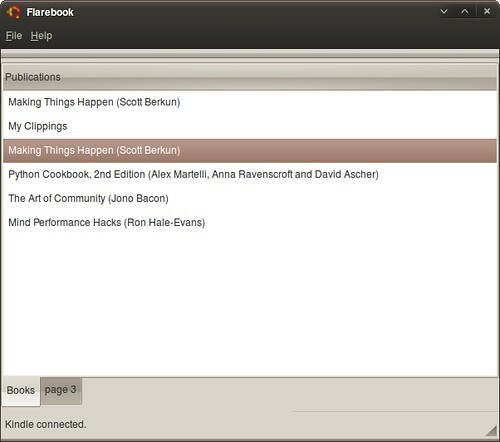 I have also been wanting to get back into a little coding, so I thought a fun pet project could be to write a little tool to browse content on the Kindle, ease getting books and MP3s on and off, and be able to grab the highlights, bookmarks and notes you can apply to document and convert them to HTML and other formats. Displays books with associated content. Grabs the highlights, bookmarks and notes, and parses them into a structured format which can be used to generate output formats (currently HTML is the only generated format). I haven’t put any code online yet because it is so primitive, but when it does a little more I will probably put it on Launchpad. A tutorial for $quickly share, and $quickly release is coming too. If you have a PPA and gpg keys set up, they should just work. Have your tried Calibre? It manages Kindle content quite well.